We will open at 9.30am. As usual we will give out numbered tokens to those at the front of the queue. Again as usual there will be a limit of 6 of the more limited items per person. Customers have always been great turning up knowing what they want so we don’t operate lists especially this year with such a ridiculous number of releases. Disappointingly no lessons have been learned by the organisers and we will spend much of the day saying sorry that titles have run out. Sorry about that ! We have decent amounts of releases from Frightened Rabbit and Biffy Clyro but not so much of some other Scottish bands. We did our best ! Glasvegas will be playing in-store to promote their RSD single at 2.30pm and Admiral Fallow will follow at around 3.30pm again promoting the release of their latest album on vinyl for the first time. 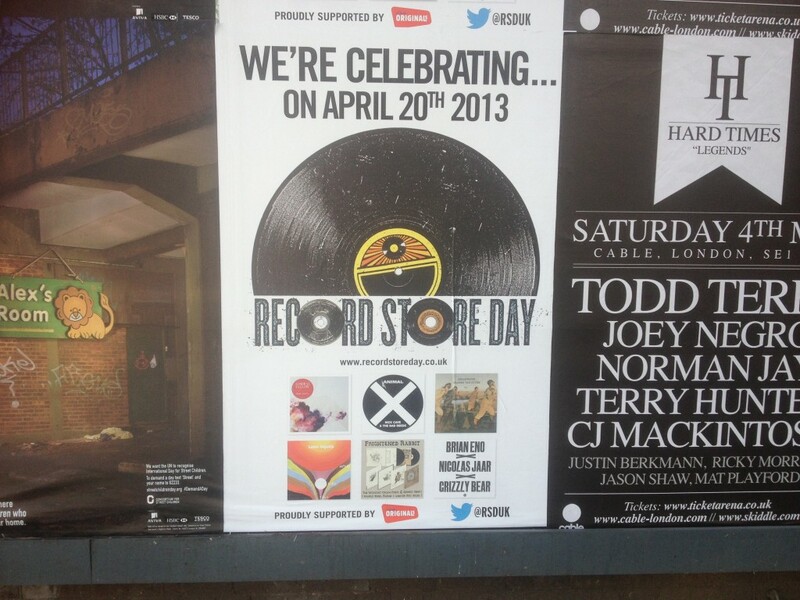 We would encourage people to actually buy more than just RSD stock especially given the vast array of vinyl we have. I’ve stocked up on lots of classic new vinyl as well as all the latest releases and of course there are many more racks of second hand vinyl with a great selection at £1.99 or 3 for £5.00. The dance 12″s are a bargain 10 for £10. When I moan at the organisers I have to admit that Avalanche itself is of course involved in the organisation of RSD and our contribution this year was the poster campaign which of course as you can see above has been brilliantly conceived and executed ! A Brazilian TV programme will be recording our celebrations for their most popular music channel over there (8 million viewers) for a Record Store Day special and they will be back again to feature Avalanche and some of Edinburgh’s bands a little later for our own featured programme. If you need to recover the Bow Bar will be hosting a special RSD cask ale “Sid ‘n’ Nancy” 6.9% IPA from Revolutions Brewing.